Home > Review: What Would Soccer Fans Change in Chelsea? Review: What Would Soccer Fans Change in Chelsea? What is Chelsea? It is one of the most expensive football clubs in the world that competes amongst the best in one of the best professional football leagues. However, while its glory days are still going on, many started noticing that the club is on a steady decline with multiple problems on all fronts. Some problems are not easily fixable as Antonio Conte noticed in his recent interview. With many problems he has to face and not enough instruments to make immediate improvements, Conte will have to outthink himself in the nearest future. 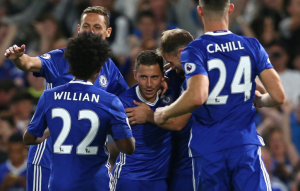 While other clubs have great history with roots going back to the middle of the 20th century, Chelsea experienced its most glorious days just recently with its most successful period being from 1997 to 2013. At the same time, their decline started about 5 seasons ago when many problems became apparent to everyone. While the 201415 season was great for the team, it seems that problems are again pursuing boys in blue. First, let’s consider statistics. In the 2014-15 season, Chelsea finished with one of the most impressive sets of statistics. Being the team that conceded less goals than any other team in the league and finishing with the biggest number of clean sheets. At the same time, the team didn’t make many mistakes while defending which led to them being the team with least errors in defense. While their offensive metrics were less impressive, the defense was a foundation they needed to be the best in the league. Many believed that this team will go back to its former shape that was fearsome 5-6 seasons ago, but it never happened. In the 2015-16 season, Chelsea managed to finish the season while being the 13th team in terms of clean sheets. At the same time, this team was conceding lots of goals mostly due to the injury that made him unable to play for quite a while. The team finished with positive 6 goals difference, but it was not enough to get above 10th place in the league. While winning heavily against weaker competition, the team was unable to win key matches that decided their position. The beginning of the 2016-17 season is also concerning. Chelsea does not score as well as Manchester City or Liverpool and doesn’t feel as robust in defense as it did in the 2014-15 season. There are apparent reasons why the team look lackluster when it comes to defending. Antonio Conte is by no means a silly coach; he knows exactly what has to be done. Many fans are criticizing him for some of his decisions, but there is little Conte can do right now. He definitely misjudged the condition of John Terry, for example. However, some problems were impossible to solve given the situation he was put in. There was one pivotal problem that negatively affected the team in the 2015-16 season. Jose Mourinho decided to release Petr Cech from the team selling him to Arsenal. With the addition of Thibaut Courtois to the lineup, Cech was of no use and Jose Mourinho decided that the team will do well even without their star goalkeeper on the bench. In the beginning of 2015-16 season Thibaut Coutois was injured and had to be replaced with Asmir Begovic. No one would say that Begovic is a bad goalie. He is a very good player worth of playing in Barclays Premiere League, but many would rank Thibaut Courtois as second best or third best goalkeeper in the world. He is incredibly talented, agile, and looks to be in his best shape. Losing him was a big deal and Begovic simply was not as efficient as his Belgian counterpart who has managed to win La Liga and played in the finals of Champions League in his 24 years. With him returning to the roster in 2016, many believed that Chelsea will start performing better than ever and that the amount of clean sheets will slowly go up. In true, Courtois managed to deliver 3 clean sheets performances against Norwich, Hull, and Burnley. However, these were three only clean sheets in this season and against significantly weaker opponents. Playing against stronger opponents was quite hard and Chelsea lost to both Liverpool and Arsenal conceding 3 goals in their match against the latter. This was quite disappointing. One of the biggest problems that Chelsea has right now is their defense. With John Terry reaching 35 years, the team simply lacks his zeal and abilities. He is very old right now and just like many other old premiere league players does not have the same impact as a couple of years ago. The same issues are troubling Manchester United with their star performer Wayne Rooney finally sitting down on the bench. Now, John Terry also sits on the bench, but the defense does not look any stronger. However, his poor performance was one of the reasons why Chelsea underperformed so heavily in the 2015-16 season. Defense struggles to find its identity and hold off the enemies. The team swapped Zouma for David Luiz and that was quite an improvement considering how young and inexperienced Zouma is. He is young and can definitely improve over time, but he is still not on the level of playing against the best forwards in the world. Cahill also underperformed in the previous season and keeps being underwhelming in this one. The only hope for Chelsea’s defense is David Luiz who still needs to adapt to the playstyle of his new team. Defense needs improvements. Right now, we could add more reliable defenders to the roster and hire another great goalkeeper just in case something happens to Courtois once again. Begovic had shown that he is not the best fit for the team and Eduardo is a questionable pick up. The midfield has been a problem for the team. In the 2015-16 season, Fabregas was a weak point and his constant underperformance guaranteed his place on the bench. Now, Chelsea’s starting 11 has 4 dedicated midfielders: Alonso, Moses, Kante, and Matic. Many fans were quite disappointed with the level of performance shown by Matic. He was struggling to adapt to the playstyle of Chelsea and while he looks better now, his position on the roster is also a big question. If Chelsea wants to improve, they need to add more solid names to their midfield. Instead, Antonio Conte bets on youth and zeal which is a good thing in the long run. Adding Alonso and N’Golo Kante looks like a definite improvement. The midfield looks more proactive and energetic, but lacks stability. N’Golo Kante is a one of the most talented young footballers available in the Premiere League. He is incredibly agile and fast. Naturally, he has stamina and endurance to compete at the highest speeds for all 90 minutes, but he is still young and needs more experience before he starts presenting a real threat in the midfield. The same could be said for Alonso. He spent several good seasons with Fiorentina, but was loaned to Sunderland and consequently ended up on the Chelsea’s roster. He is a smart player and can definitely add something to the team, but no one would say that he is a significant improvement. Respected online bookies give conservative odds when it comes to Chelsea matches and it is totally understandable. While Chelsea does not have the most promising roster, their potential is explosive and many expect them to win games out of blue completely surprising their opponents with fast rotations and overwhelming energy. This works well against some middle-of-the-pack teams, but proves to be inefficient when playing against better teams. This is one of the most controversial things about Chelsea. While their lineup manages to deliver great goals from time to time and looks like an efficient mix of experienced and young players, many fans are skeptical about some players and would like to see them gone. Which is quite understandable considering more than disappointing performance of the team in the previous season. William is a good winger from Brazil, but his performance has been lackluster. Yes, he is not a striker and should not score all the time, but scoring only 13 goals in 112 matches is still an underwhelming result for a player that is usually positioned for assists and goals. He was a mediocre performer for the team. However, it is hard to say that he is bad. He is just not as good as many would like him to be. At the same time, many fan consider picking up Diego Costa a mistake. He is still good at his position and knows how to finalize attacks with a goal, but he is old and much slower than he used to be. There could be an improvement. The problem is that Chelsea does not have a good backup plan. They picked up Mitchy Batshuayi and he is a promising talent, but Diego Costa still plays as the first violin. We would like to see more Mitchy. We do not even want to start the talk about Hazard whose performances were quite underwhelming to say the least. Chelsea has a lot of problems in all areas of the field. We believe that fans would like to see a midfield with more reliable players who would reduce the pressure on Chelsea’s defense that looks lackluster. Improvements in defensive positions also could be made. Also, Chelsea desperately needs more independent offence and a good goalkeeper to back up Courtois if needed.